Debi Weir at the Moray School Bank. A north-east charity that aims to lessen the burden of school uniform expense on families has had its referrals soar. During the whole of the summer holidays last year, the Moray School Bank helped 91 children get ready for class. However, this year the group has already received 106 referrals with three weeks still to go before pupils return after the break. 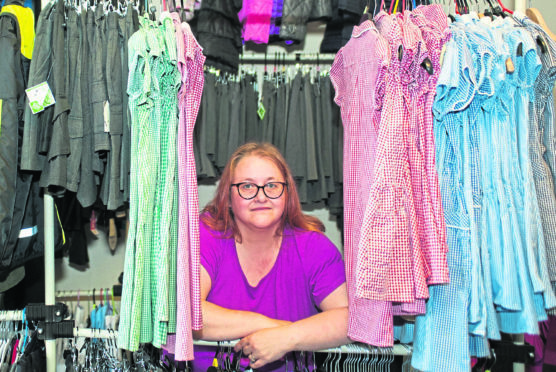 Last night, the charity’s chairwoman, Debi Weir revealed she was receiving “three or four” calls every day from parents concerned about being able to make ends meet while ensuring their children are suitably dressed. She said: “It can feel like uniforms cost a fortune when parents don’t have the money. Mrs Weir added: “It’s hard to say what’s caused the increase. Welfare reform has played its part with people changing to universal credit. I spoke to a parent the other day who said she wouldn’t be getting money for six weeks. Rothes-based Moray School Bank was formed in January last year to gather together hats, scarves and gloves in order to keep pupils warm during winter. Support is offered to families who are referred to the charity by professional organisations – including the council, the NHS and charities. Mrs Weir added: “We do speak to the families so we know what their child is going to wear. There’s no point handing out stuff if it’s just going to sit in a drawer. We want them to feel confident in what they’re wearing. This year the Scottish Government has launched a new £12million, supported by councils, to award grants of £100 to help families buy school clothes. Moray MSP Richard Lochhead said: “If it wasn’t for Moray School Bank so many people would be facing a lot more worry with the new school term fast approaching. Items can be dropped off for the Moray School Bank at Matalan or CCL Property, both in Elgin, Moray Foodbank or Tesco stores in Elgin, Buckie, Keith or Forres.